HAPPY BIRTHDAY, SMOKEY THE BEAR TURNED 70 ON FRIDAY, AUGUST 8, 2014. Wow, hard to believe that Smokey the Bear turned 70. Smokey the Bear is probably one of the best and enduring PSA’s put out by the government and the US Department of Forestry. Over the decades Smokey the Bear has had makeovers. Personally, I like the 50′s and 60′s Smokey. What is most interesting is that Smokey’s PSA’s were not originally from the Forestry department, but from the “Wartime Ad Council” instead. Smokey’s job was to warn Americans of the danger of forest fires, not those set by Americans, but by the Japanese. During World War II, Japan launched fire bombing balloons into the jet stream hoping to destroy American natural resources. Happy birthday, Smokey Bear! Forest firefighting symbol turns 70. The Forest Service unveiled Smokey Bear as a symbol for fire prevention on Aug. 9, 1944. Tidwell said the country averaged about 160,000 wildfires annually in 1944, compared with 60,000 today, a decline he attributes to the Smokey Bear campaign. Up to 90 percent of U.S. wildfires are caused by humans, according to the National Park Service. Tidwell said today’s wildfires tend to be larger due to drier, hotter weather. With more people living near forested areas, Smokey’s message is more relevant than ever, he said. Smokey Bear just turned 70 years old, and his image is getting a reboot, reports CBS News’ Ben Tracy. “Smokey has had a little work done. His costume has been updated… He’s got a fresh new look,” said Peggy Conlon, president of the Advertising Council, the organization that has overseen Smokey’s iconic image from the beginning. Smokey’s job was to warn Americans of the danger of forest fires — not those set by Americans — but by the Japanese. During World War II, Japan launched fire bombing balloons into the jet stream hoping to destroy American natural resources. 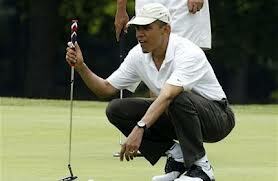 President Barack Obama spent his 51st birthday, doing what else but golfing of course. This is nothing new and unusual, it will be Obama’s 104th round of golf since he became president as Obama played gold at Camp David. I am guessing that those Americans that are apart of the 8.3% and the 17% underemployment were kind of hoping that President Obama was actually going to keep his word that jobs were his number one priority. However, when Obama made fundraiser and golf a grater priority than meeting with his own Jobs Council, Americans probably think its time for change and Barack Obama can spend his next birthday no longer president. In an email to supporters, Barack Obama warned that his birthday “could be the last one I celebrate as president of the United States, but that’s not up to me — it’s up to you.” Yes it is and its about time this country has a Commander in Chief and someone focused on the economy, not class warfare. 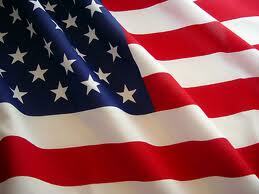 Happy Birthday America, to the greatest nation on Earth, the Home of the Free and the Land of the Brave. However, it is each generations responsibility to maintain the freedoms and liberties that our Founding Fathers bestowed on us with their sacrifices. Remember America, freedom is not free. As you celebrate this 4th of July with family and friends remember also that it is not government, but your Creator that you are endowed with certain unalienable Rights. In a time in which it would appear that more and more Americans accept being dependent upon their government, maybe it is a good time for “We the People” to really understand and realize what others died for our rights to be free. A note to the present day politicians whether they be Democrats, Republicans or Independents … Today “INDEPENDENCE” is to be celebrated, not dependence. The United States of America was founded on liberties and freedoms endowed from their Creator, not by government laws made to silence, enslave and make “WE THE PEOPLE” dependent on others. Do not allow an administration to promise entitlements and forever enslave you to the government. Do not ever forget what made America and Americans exceptional. If you do not stand up and say no and do things for yourself, as stated at Hot Air, we will become a government dependent society just like Europe. In 1776 “WE THE PEOPLE” fought a War for Independence and against a tyrannical government. Men fought and died to throw off a tyrannical government and sought to put one in place that was of, by and for the American people. I would dare say that our Founding Fathers would cringe to see what their brave efforts have been transformed into today. Never forget America, whether it be with a musket in 1776 or a vote in present day, it is your responsibility to uphold the following words from the Declaration of Independence signed this day in 1776 … “That whenever any Form of Government becomes destructive of these ends, it is the Right of the People to alter or to abolish it, and to institute new Government … But when a long train of abuses and usurpations, pursuing invariably the same Object evinces a design to reduce them under absolute Despotism, it is their right, it is their duty, to throw off such Government …” America, do not ever let your voice be silenced and it is your God given right to uphold the values, virtues and liberties that were fought for you 236 years ago. America is worth fighting for, and it is your responsibility to do so. And to the Republic - Republic, a state in which sovereign power is invested in representatives chosen by the people to govern. And government is the people; and it’s from the people to the leaders, not from the leaders to the people. My heart cries out… my pulse runs fast at the might of her domain. You ask me why I love her?… I’ve a million reasons why. My beautiful America… beneath Gods’ wide, wide sky. Powerline reminds us of the eternal meaning of Independence Day and a tribute to Abraham Lincoln. Today the Oreo cookie turns 100 years old. Talk about withstanding the test of time. The first Oreo cookie, called the Oreo biscuit, was sold in Hoboken, New Jersey in 1912. The Oreo is the top selling cookie of the 21st Century. Admit it, you twist them open and eat the cream filling before you eat the cookie. The Oreo Cookie has proved it can withstand the test of time. The chocolate cookie with cream in the middle has been around since 1912. Today, Kraft Foods is celebrating the Oreo’s 100th birthday in grand fashion—hosting more than 100 “birthday parties” across a dozen countries, plus games on their website, and you can even buy a package of limited edition “Birthday Cake Oreos” to celebrate the occasion. For $4 on the company’s website, you can also send a friend a coupon for a free package of Oreos. Check out the nostalgic ads of Oreo over the years at the Daily Mail. 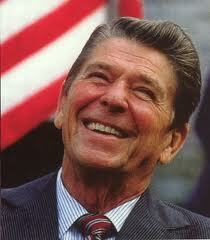 To a great American … HAPPY BIRTHDAY PRESIDENT RONALD WILSON REAGAN. Ronald Reagan was born on February 6, 1911, he was the 33rd Governor of California from 1967–1975, he became the 40th President of the United States from 1981 – 1989 and would go down as one of the greatest Presidents of the 20th century. Reagan was beloved by many and was a true outsider of “Inside the Beltway” politics. He was just as much an outsider to the country club Republicans as he was Democrats, which is what made him so effective and beloved. Ronald Reagan reminded us of one important fact that has been obviously lost today by many Republicans and certainly by the current administration, “Government is not the solution to our problems, government is the problem” (VIDEO). May American continue to embrace the legacy of President Reagan, they just don’t make him like this any more even though we would be better off if they did. As stated in the UK telegraph, “Ronald Reagan is remembered almost universally as a man of wit, humility, warmth and optimism”. Let us also not forget patriotism. He made us feel better about ourselves and that we could do anything, never apologizing for what we had done in the past, only that we could make things better for the future. It was not just the words, it was the way the words were communicated to the American people as if he was speaking to each and every one of us personally. There was a belief and trust in the words of Ronald Reagan that allowed the United States to emerge in the 1980′s from the depths of the misery of the 70′s. As stated by the Gateway Pundit, President Reagan knew how to deal with dictators and it was not to appease or bow down to them. President Ronald Wilson Reagan was simply brilliant. Reagan could be serious, compelling, healing and humorous. The key fact is that he always knew when to have the correct communication tone to the American people, our allies and our enemies. How revered and respected was Ronald Reagan? During his years as President the MSM and Democrats savaged him just like they do the GOP today; however, in order for the MSM to try and rehabilitate Democrat Barack Obama’s presidency, they try to claim he is “Reaganesque”. He healed a Nation following the Space Shuttle Challenger tragedy. As president, Reagan implemented sweeping new political and economic initiatives. 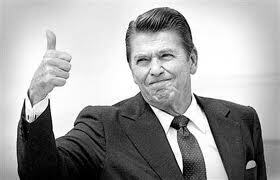 His supply-side economic policies, dubbed “Reaganomics,” advocated reducing tax rates to spur economic growth, controlling the money supply to reduce inflation, deregulation of the economy, and reducing government spending. In his first term he survived an assassination attempt, took a hard line against labor unions, and ordered military actions in Grenada. He was reelected in a landslide in 1984, proclaiming it was “Morning in America.” His second term was primarily marked by foreign matters, such as the ending of the Cold War, the bombing of Libya, and the revelation of the Iran-Contra affair. Publicly describing the Soviet Union as an “evil empire,” he supported anti-Communist movements worldwide and spent his first term forgoing the strategy of détenteby ordering a massive military buildup in an arms race withthe USSR. Reagan negotiated withSovietGeneral Secretary Mikhail Gorbachev, culminating in the INF Treaty and the decrease of both countries’ nuclear arsenals. HAPPY BIRTHDAY MR. PRESIDENT, TO THE GREAT COMMUNICATOR … WE MISS YOU!